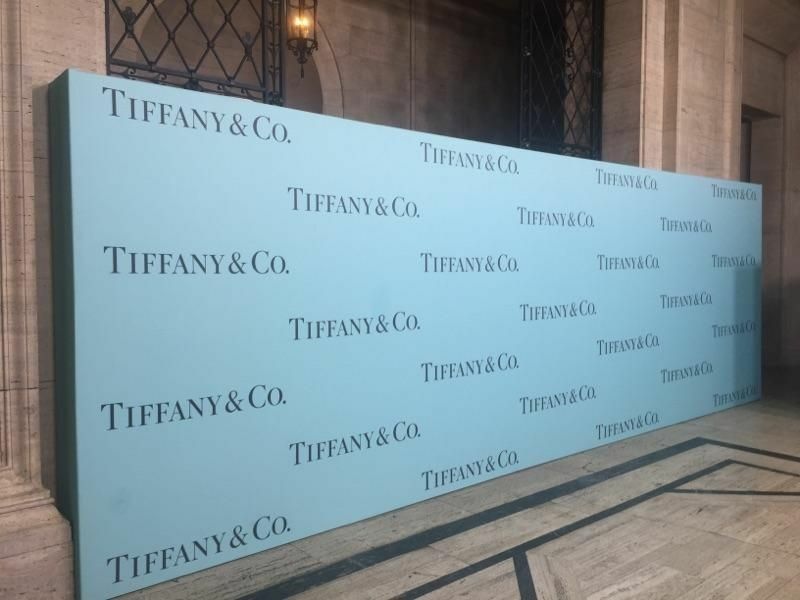 Here we have a step and repeat banner for luxury jewelry brand Tiffany & Co. Its minimalist approach offers a sense of sophistication and class; showing off their iconic brand typography on a classic white background, a true testimony to years of solid branding. 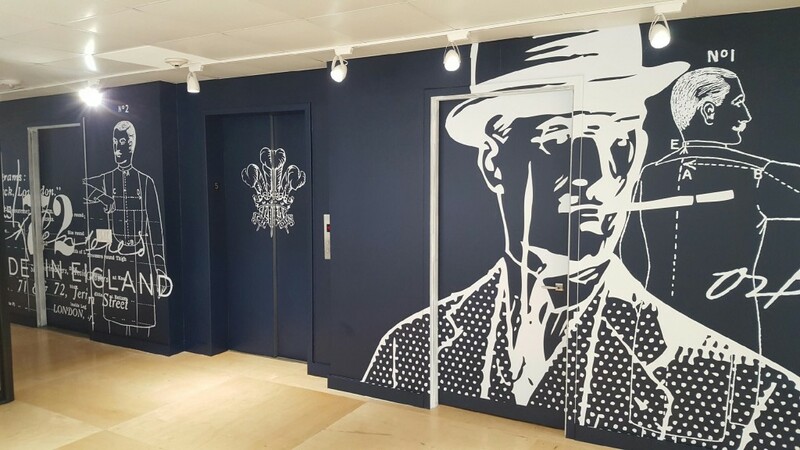 Hands down, wall graphics are one of the most popular ways brands make use of empty wall space. If you have a blank wall and feel like you’re not taking advantage of its potential, fill it up with a visually stunning graphic. Whether it be in-store or off-site, you can turn any bland backdrop into something special. 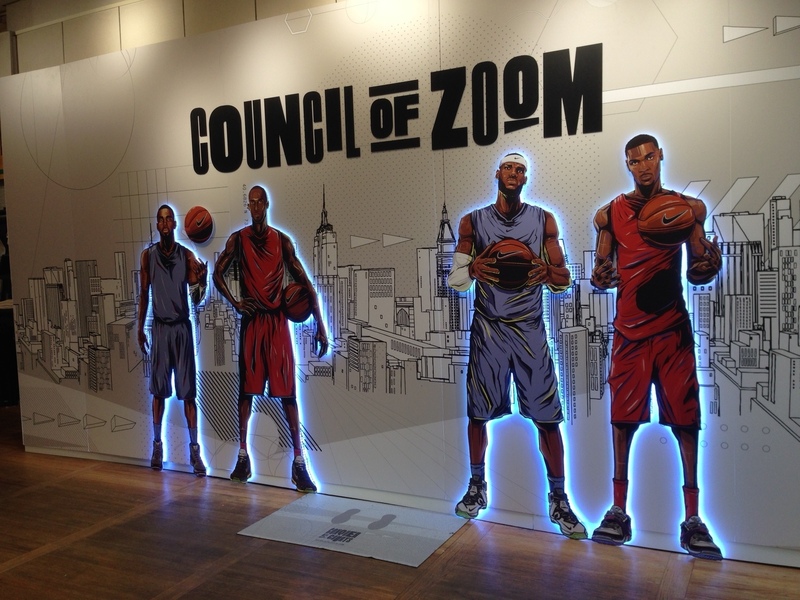 Featuring the Council of Zoom, an example of when Nike used large format graphics in a ‘litup’ marketing campaign. Here you can see how the athletes glow via LED lights on a black and white backdrop – super flashy. If you’re looking to turn your marketing message into something larger than life, then you may want to consider adding some light within your large format graphic. 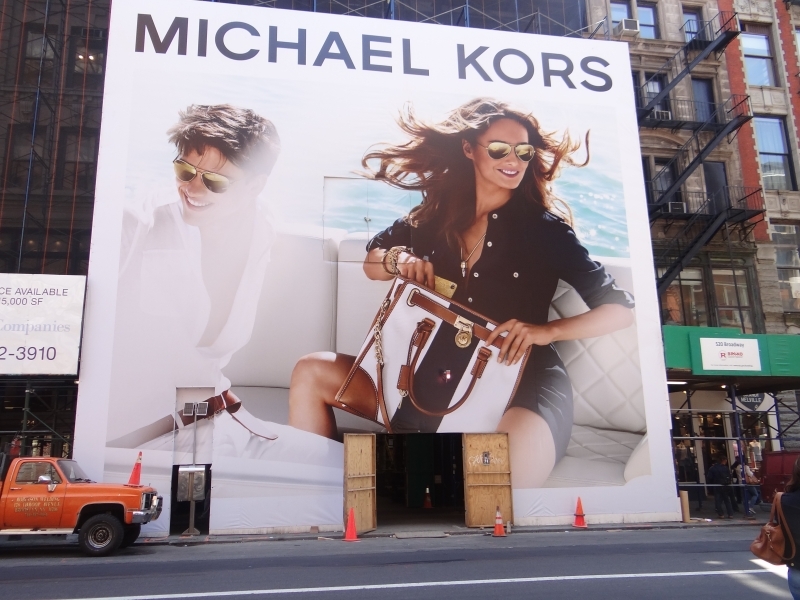 Famous sportswear fashion brand Michael Kors and their store barricade show us a great example and one of the best ways of how a business can use large format graphics to get their marketing message across. The storefront is a great way to build buzz around a grand opening, especially when you are vying for the attention of window shoppers. Container Vinyls A lot of businesses are repurposing shipping containers these days. However, in spite of the clever idea, most of the repurposed containers are visually unattractive. With large format graphics, anyone looking to repurpose shipping containers can make them look more appealing to the environment. Corporations love to do it big. 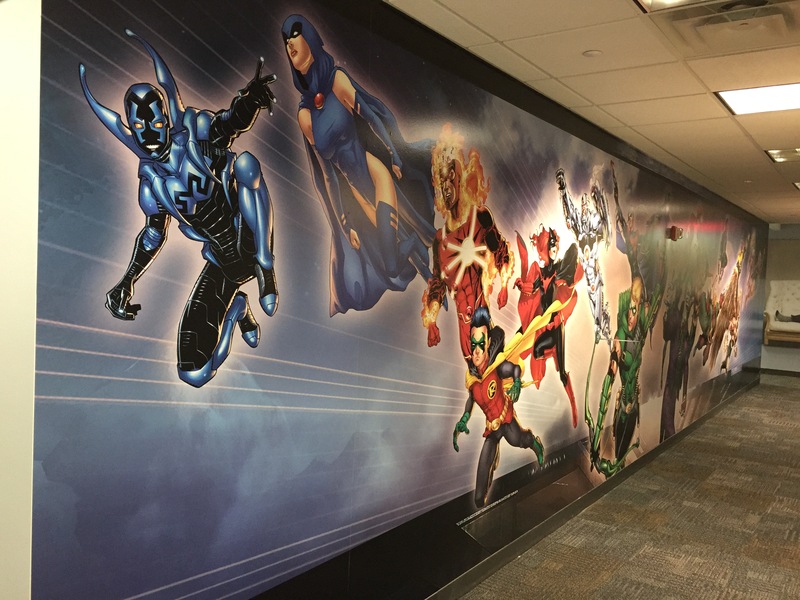 Here we have a cost-effective corporate mural recreating an action-packed scene across a hallway wall. With large format printing, you can get the same effect indoors while taking your target audience on an out-of-this-world journey. Whether it be for a Comic-Con, a movie release or an international auto trade show – you’ll be able to instantly woo the crowd. Classic, personal and magnetic, stretch canvases are a great way to add a personal touch to an impersonal wall. From digital fine art photography to classic paintings to your very own creations, you can take a special photo and turn it into a stretch canvas. 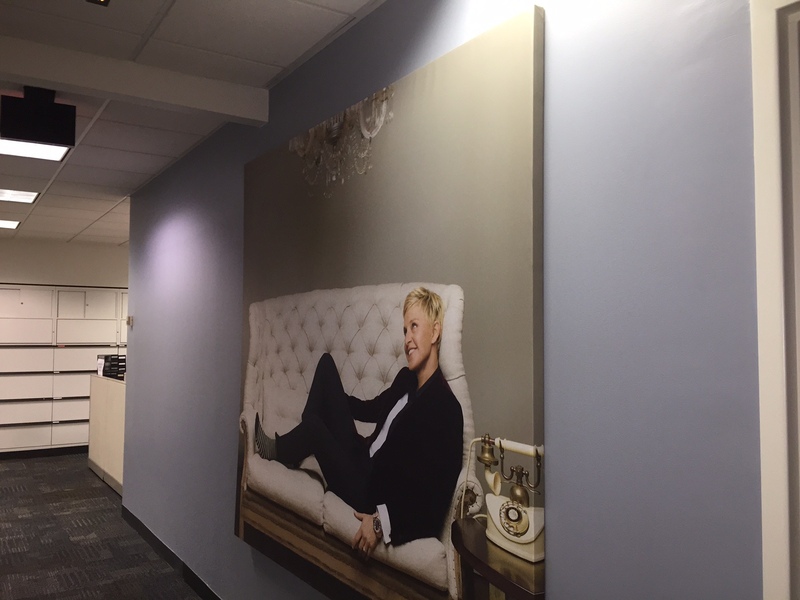 Here we have a one of a kind image of Ellen DeGeneres lying on a white couch. Window Vinyls are a great way to market your message and leverage window space. Businesses can hide what was once there, create mystery and tell a new story – beckoning prying eyes. You can surely “wow” your visitors with vinyl panels that effortlessly catch attention. For any business with multiple workstations looking to market products or services, large format graphics on towers are a no-brainer. 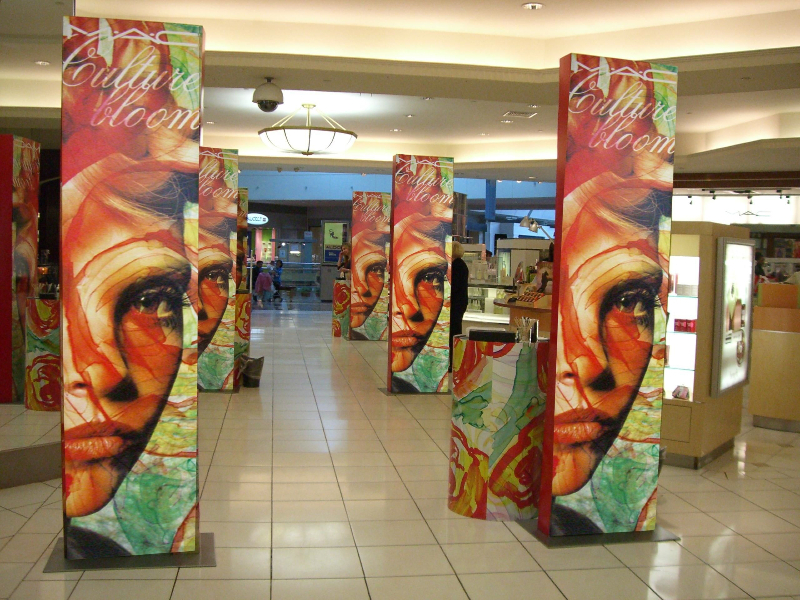 Printing towers are the perfect medium for those in fashion, beauty or technology to just to name a few verticals. They provide a uniform communications message consistently as a team while working independently. Traffic intersections are one of the best places you can prop up your marketing message. You’ll be able to make an impression on anyone driving passed or idling in traffic. 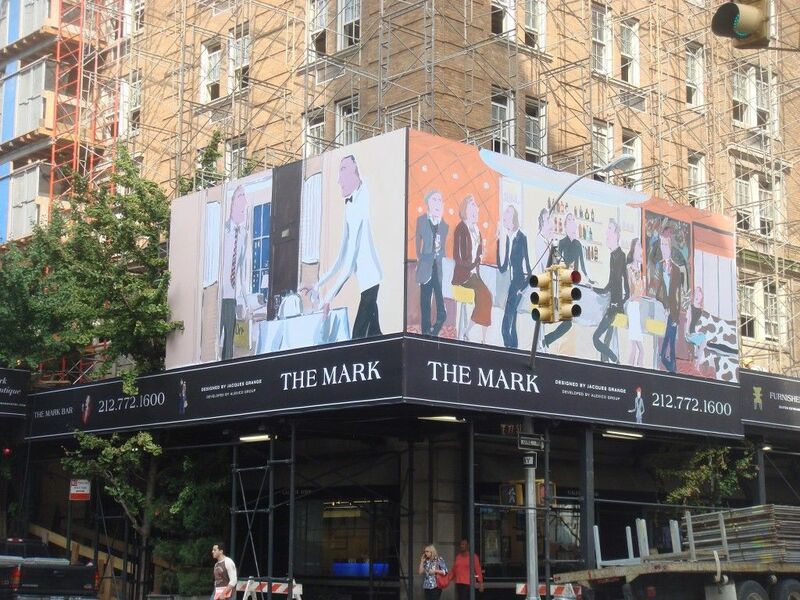 And for whatever reason, if your building or storefront is going through renovations, large format graphics like these are a great way to keep your marketing message above the clutter. Fabric banners have a certain aesthetic that promotes royalty, success, and wealth. They are easy to market, store and are also a classic way to promote your message. 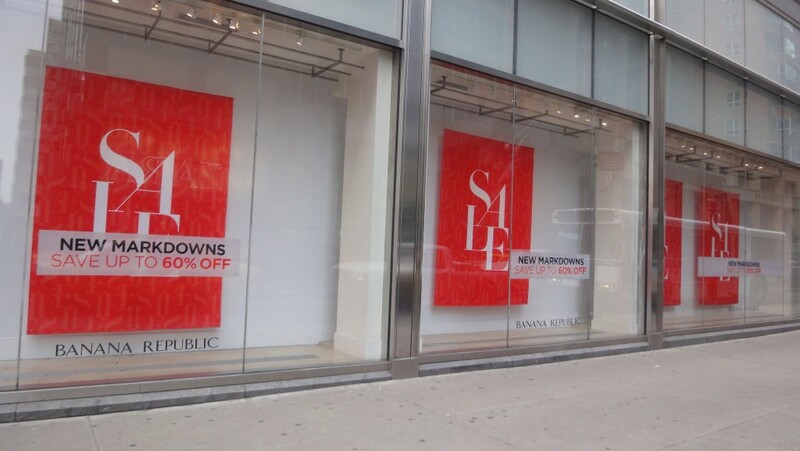 The example above showcases our fabric banners elegantly hanging from the window displays of Banana Republic. If you’re in the communications and marketing field chances are that at some point you’re going to take your message to the masses. Large format graphics helps amplify your message and deliver high-quality communications within your budget. 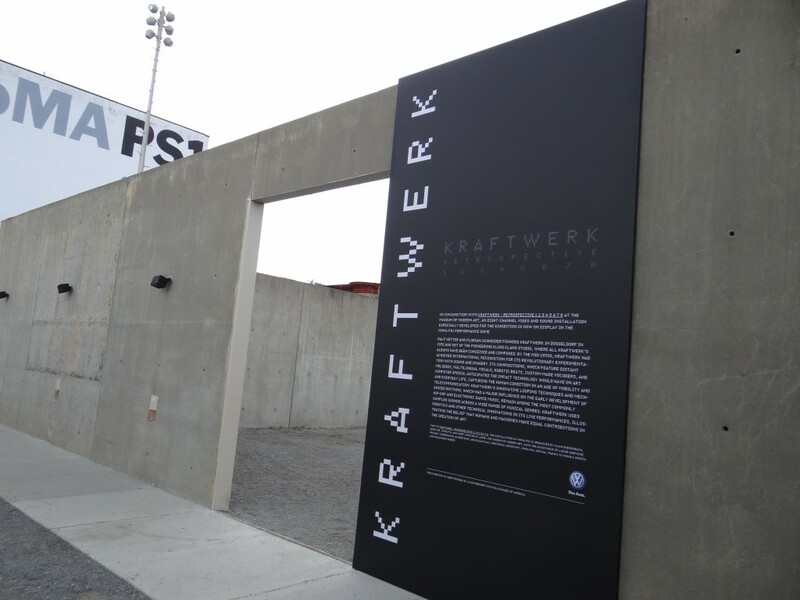 This article showcases just a sample of the best ways you can use large format graphics for your marketing message. If you think we missed out on your favorite method, let us know in the comments section below.